Older vintage tech sheets are available on request. To check availability for sale please visit our wine shop. 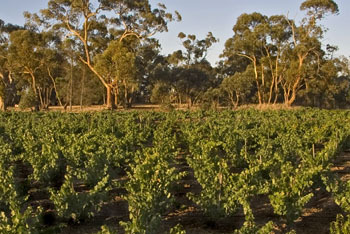 The Barossa Valley is the source of our Shiraz. 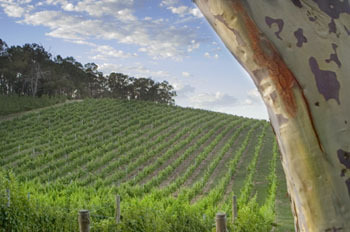 With it’s hot, dry conditions and fairly level valley floor and undulating hills, this appellation is generally recognized as the best red wine district in Australia. 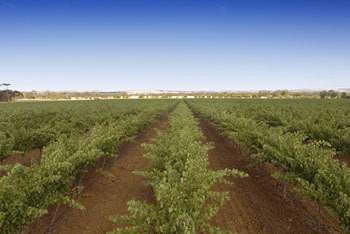 Our Kalimna property is located next door to the traditional Penfolds Grange “mother source” vineyard. The unforgiving soils of this area are well known to produce very low yields, loose clusters and extremely small berries. Classic, ultra premium Shiraz territory! Daryl looks for a little less wood in his Shiraz than is typical of Australian Shiraz. He wants a wine that is rich, but not overly jammy, tannic, or oaky in flavor so that it can show off the spicy, anise, berry flavors - true varietal characters in the grape. He is looking for a firm, fleshy structure and a fine texture. Daryl achieves his results by traditional and gentle winemaking methods: fermentation is small batches, punched down in open-top vessels; a skin maceration of only 6 days; minimal handling throughout and aging in American oak (half new, half 1 year old). Careful barrel selection increases the quality and consistency of our Shiraz. Lenswood, in the Adelaide Hills appellation of South Australia, is where our Sauvignon Blanc is grown. It is a very cool climate with relatively high winter rainfall. Our Lenswood vineyard is dedicated to Sauvignon Blanc and is producing stunning Sauvignon Blanc grapes. Daryl says that the vineyard conditions are so perfect that all he has to do is harvest at the right moment and then get out of the way and not muck things up! What emerges from this clean, uncomplicated winemaking approach is a wine with brilliant acidity and flavors that balance citrus with floral. Brighter than California Sauvignon Blanc, and a little less pungent than New Zealand, this wine exemplifies the Adelaide Hills appellation as a world class Sauvignon Blanc producing region. Our wine is 100% Sauvignon Blanc fruit, 100% stainless steel fermented with no oak contact and 0% malolactic fermentation. Daryl’s aim is to get the incredible, intense fruit flavors from the vine into the glass. This wine showcases pure Sauvignon fruit at its very best. Links to vintage specific technical information for each vintage. Zinfandel is a grape variety whose origins are believed to be from Europe, possibly Croatia, where it was traded to Italy and referred to as Primativo. Zinfandels success is primarily related to California where it has been grown for 150 years. It is produced by many wineries and receives cult status among wine lovers. Many believe this variety is to California what shiraz is to Australia. Zinfandel is a hearty variety. 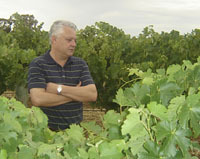 It produces its best wines in areas where the grapevine needs to work hard. Our Kalimna shiraz vineyard has just the micro-climate to experiment with this variety to endeavour to produce wines that match Californias best. It is no secret that the best California Zinfandels are from old vines, grown head-trained (aka bush vines). With this principle in mind we decided to plant and train our vines to this method. More time consuming, less yield but hopefully high quality. Our 8 acres of bush vines have been designated the Bush Block. This first release is a solid wine displaying very typical zinfandel hallmarks. Brick red in colour, a very spicy, raisiny aroma and a rich medium weighted palate with some apparent sweetness, although the wine is dry. This sweetness in taste comes from the higher alcohol and raisining of some of the grapes. This wine can be very much enjoyed with pasta or red meat, and will be fantastic with cheese to end a meal.